Although this next room was way beyond the comfort zone of my usual budgetary stomping grounds, this demo was just too good to pass by without a -- very -- honorable mention. 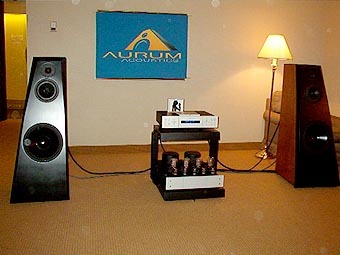 Hailing from St. Johns/Newfoundland, brand-new Aurum Acoustics showcased their innovative Integris Active 300B loudspeaker system (CDN $30,000) and Integris CDP CD player/preamp (CDN $10,000). 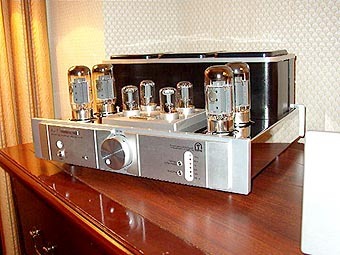 As Srajan mentioned in his CES report, this concept of a high-end actively amplified tube/transistor speaker system for home use is long overdue. 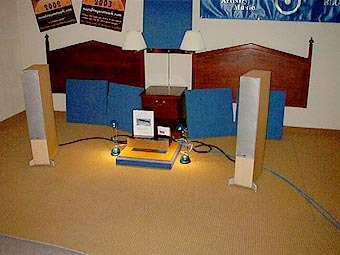 These large 3-way loudspeakers have sealed cabinets with an anechoic response of -6dB at 20Hz. A full Cardas cabling system is provided using Neutrik 4-pin XLR terminations for the mid/high drivers rather than conventional binding posts. The hybrid amp contains four channels of amplification and active crossover circuitry all in one chassis. The midrange and tweeter drivers are driven directly by single-ended 300B triodes, the woofers by Bryston-designed solid-state amps. There are no passive crossover components anywhere in the signal pathway between amp and transducers. The Integris CDP sports Anagram's 24bit/192Hz technology, a top-loading Philips CDPro2M transport with magnetic disc clamp and a multitude of connection options. Provisions for DSP software updates are available via a rear panel COM port. A Harmony universal remote is included to control this system, and codes for thousands of products are available for download. This was one killer system! Considering how large these speakers were, I was surprised how well they aurally disappeared. Music playback was full-range and transparent. 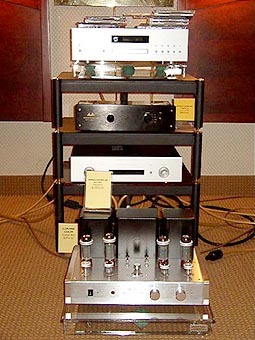 If I had the room for this system, I'd have begged Aurum's Derrick Moss for a review loan. I strongly suggest that my 6moons colleagues consider dropping Derrick an email, provided of course they have the space to do this exceptional system justice. However, Derrick did hint that smaller speakers may be available in the near future. Regardless, this was a great idea beautifully realized. The complete package including cabling retails for $40,000. 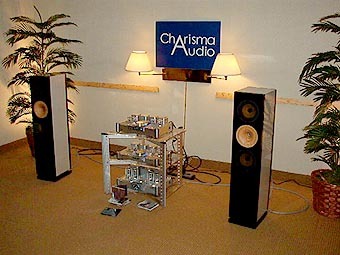 Markham Ontario's Charisma Audio displayed their range of Shanling and HIT Audio products along with an intriguing prototype loudspeaker system featuring a horn mid/tweeter. 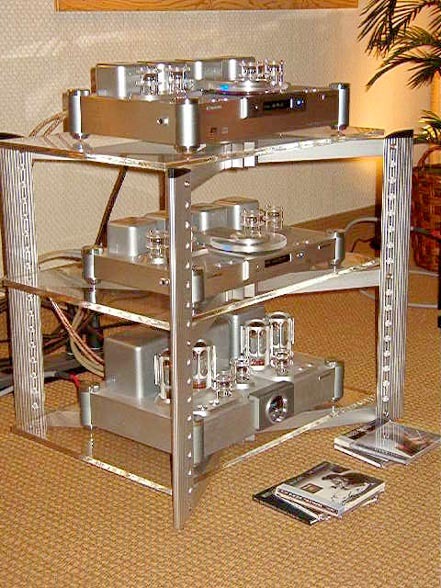 This system was fronted by Shanling's CD T-100 (CDN $2599) CD player, SCD T-200 SACD/CD machine (CDN $3499) and a rather sweet-looking tube integrated amp. 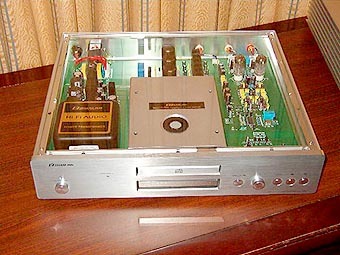 On static display were Shanling's tube-based CD-T80 (CDN $1399) CD player with selectable upsampling and HIT Audio's MT-88 (CDN $3249) integrated amp. For the price, both appeared to be of exceptional built quality. Who says you need big speakers to play Mahler? 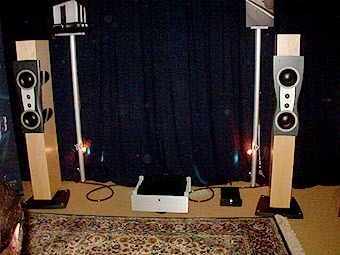 Divergent's Tash Goka was kind enough to play the entire last movement of my disc of Mahler's 4th symphony through his new Reference 3A Dulcet (CDN $2100) 2-way monitors - thanks, Tash. I was greatly impressed with their open, engaging and remarkably coherent performance. The Dulcet's proprietary carbon fiber woofer is direct-coupled and eschews crossover components in the signal pathway - which is probably why I liked them so much. $1,700 US may seem a lot of money for such a small pedestal speaker, but if you do manage to hear them, I'm sure you'll agree that they are indeed attractively priced. These lovely finished 'shoe boxes' definitely go to the top of my review lust list. 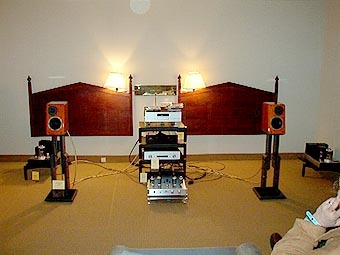 The Dulcets were partnered with Divergent's other marques; Copland, Antique Sound Labs, Van den Hul and Chang Lightspeed. This was one of my favorite rooms and I only wish I could have stayed here longer. 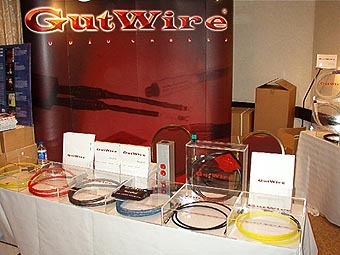 Downstairs at the Delta, GutWire displayed their wide assortment of power cables, interconnects, loudspeaker cables and connectors. Also on hand was the MaxCon (US $899) line conditioner which I currently have in for review along with the Power Clef SE (US $859/5.5ft) and Clef C (US $609/5.5ft) power cables. 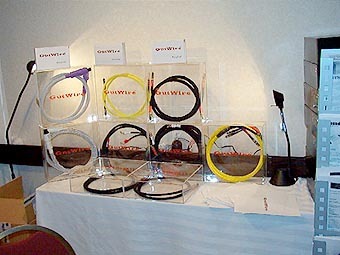 GutWire offers a wide assortment of well put together cables to meet a wide range of budgets. My experience with their products has thus far been very positive. 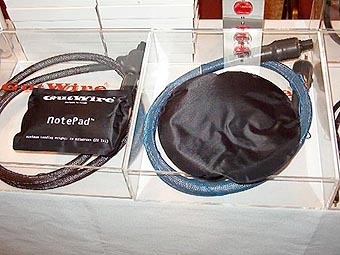 GutWire's Herbert Wong also showed me a larger circular prototype of their vibration-damping NotePad dubbed the SoundPad. 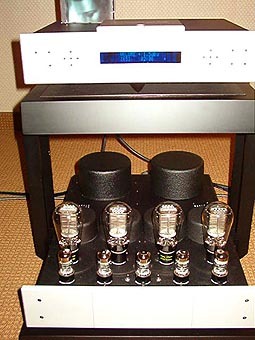 Blue Circle offered a svelte, fine sounding yet inexpensive system featuring their new 50-watt BC100 (CDN $1995) stereo amplifier, BC101 (CDN $2245) preamplifier, system cabling and one of Blue Circle's Music Ring balanced power AC conditioners. 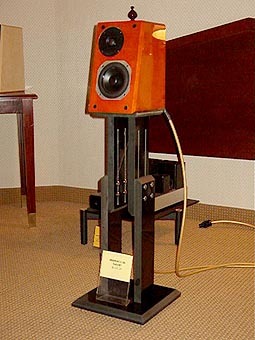 Loudspeakers were Energy's very cool-looking C-7 floorstanders from their re-vamped Connoisseur series. This was another room that impressed me with its careful setup, pleasant sound and attractive appearance. Simaudio did a stellar job at reducing the negative sonic effects of a very small, acoustically challenged room by strategic placement of curtains. Considering the size of the Dynaudio Confidence C2s, I was surprised at the lack of standing waves and excessive low frequency bloat. 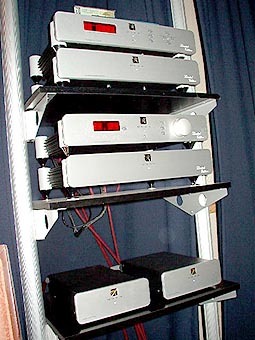 The C2s were driven by Simaudio's Moon Limited Edition electronics including the W-5 LE dual mono power amplifier and together gave a warm and inviting presentation. 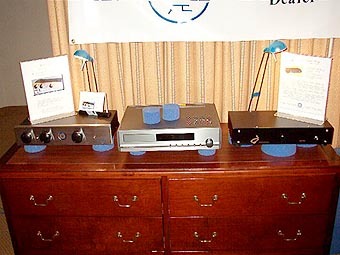 On static display were the Moon Nova LE and Equinox CD players as well as the i5 LE and i3 integrated amplifiers. 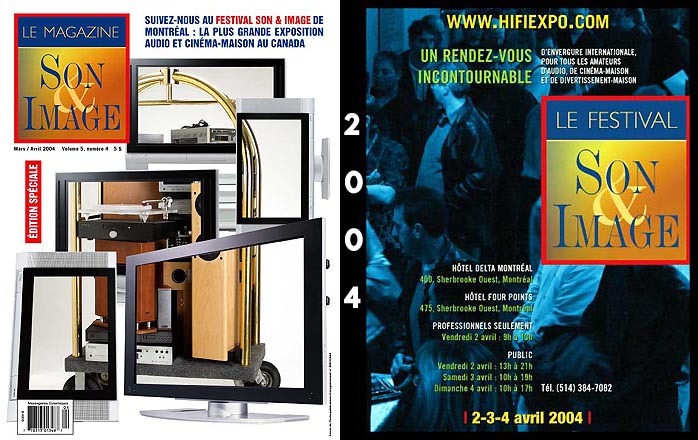 Les has reviewed their products in the past and had many positive comments as well. Perhaps I should get with Simaudio to request an i3 or Equinox for review? 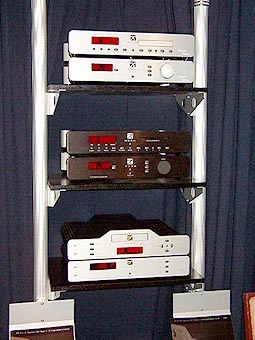 Coming soon: Naim, Eastern Electric, Omega, Tetra and more.